Farmers. Ranchers. Government officials. Industry representatives. Over the years, Greg Kerr has had many discussions with all of them about water in Wyoming. Wherever you go in Wyoming, water—or the lack of it—is a prime topic of conversation. And the subject can run the gamut: from drought caused by sparse winter snowpack to pine beetle forest destruction to the impacts of water resource management decisions made by municipalities. While UW has, for years, conducted much research to preserve water now and for future generations, the stage is set for UW’s greatest study into one of the state’s most precious resources. 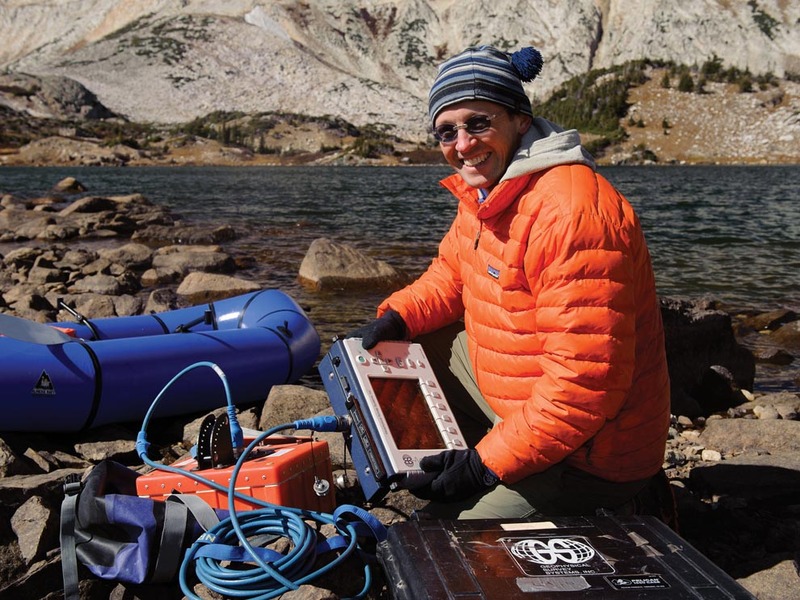 Armed with a five-year, $20 million National Science Foundation grant to Wyoming EPSCoR (Experimental Program to Stimulate Competitive Research), the largest research award in the university’s 126-year history, UW is primed to take especially important steps toward understanding Wyoming’s surface and subsurface hydrology. With the funding, UW has created the Wyoming Center for Environmental Hydrology and Geophysics (WyCEHG, pronounced “Y-Keg”). 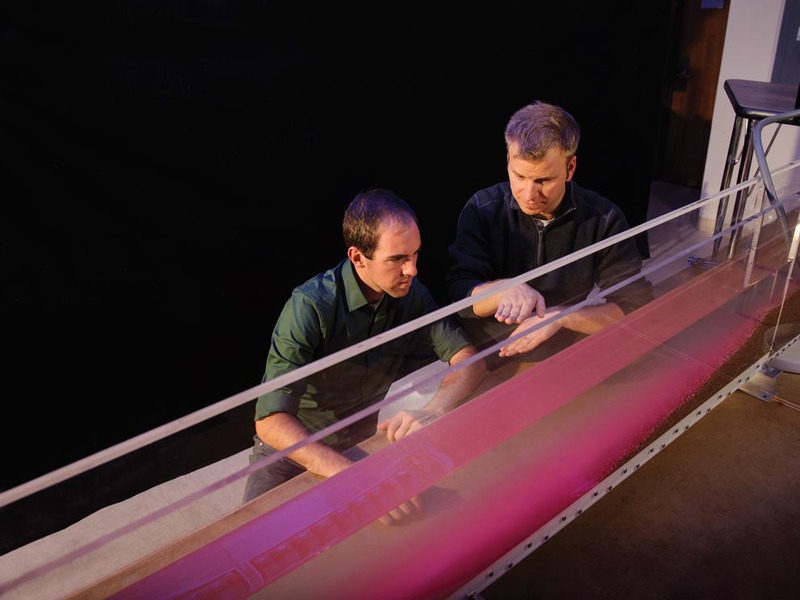 The multidisciplinary center provides new physical and intellectual resources that can be used in comprehensive research that links surface and subsurface watershed hydrology, geophysics, ecology, geology, remote sensing and computational modeling. Hydrology in Wyoming is driven by mountain snowfall, summer rain and river flow. These primary factors determine the state’s water supply— good or bad. But the fate of water in the subsurface is not as well understood. How is it distributed to groundwater, river flow, soil water or into plant tissues? The answers to those questions will help improve predictions of groundwater recharge to basins and deliveries to reservoirs. Surface and subsurface observation will be conducted using EPSCoR grant purchases of portable monitors, imaging equipment and isotope tracers—stream flow, groundwater and geophysical devices that act similar to an MRI. The goal is to measure, image and then model the transport of surface and subsurface water to better understand the processes at work. 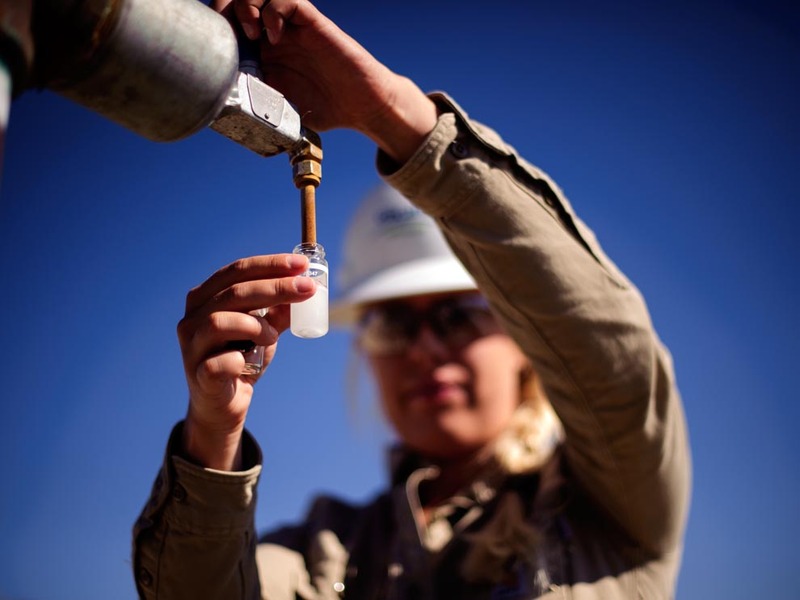 The university’s work with Bureau of Land Management to develop strategies to manage the environmental impact on water in parts of Wyoming that are undergoing oil and gas development has been ongoing since 2007. Miller says UW researchers place instrumentation in the field and work with field offices across the state. Computer models show surface disturbance— flow, erosion and salinity— in areas most vulnerable in Wyoming, including the Colorado River Basin. 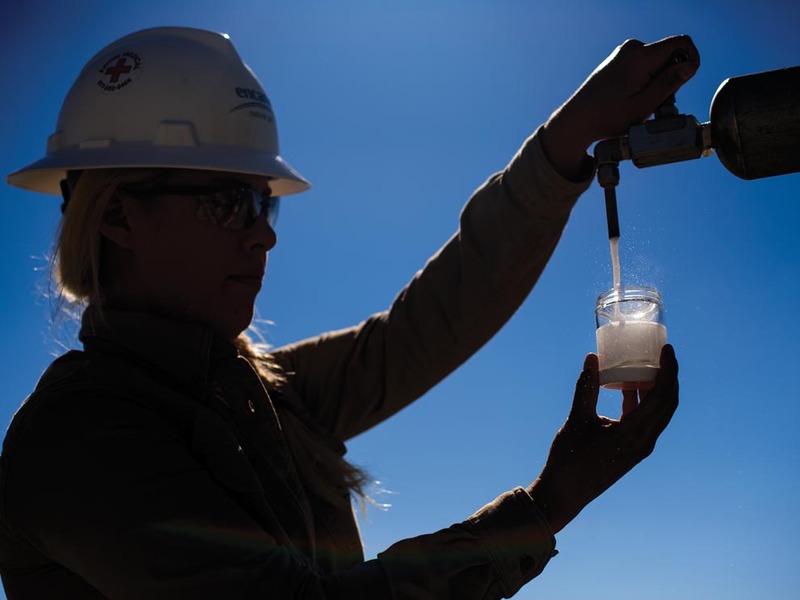 Some UW researchers already have worked to address salt levels in water where minerals are mined in portions of the Powder River Basin. KJ Reddy, a UW professor of ecosystem and science management, recently conducted a study to determine how the quality of water from a wellhead changed when it was placed in a holding pond. Salt levels were measured in the holding ponds to determine whether the water met drinking standards. “It informs the Department of Environmental Quality, landowners and industry, which helps them to manage this water,” Reddy says. Despite UW’s breadth of knowledge, there are natural challenges that require additional study. One issue that continues to receive attention is tree kill caused by pine beetle infestation. Brent Ewers, a UW associate professor of botany and the program in ecology, says the detrimental effects of pine beetles on trees play a major factor in water budgeting. Recently, Ewers studied forest stands in the Chimney Park area, southwest of Laramie on Highway 230 above Woods Landing, and in the Glacier Lakes Ecosystem Experiment near Brooklyn Lake, above Centennial on Highway 230. Before his study, Ewers surmised that, in pine beetle kill areas, more water would end up in the soil and in streams. At Seminoe Reservoir, UW researcher Brandon McElroy is looking for answers to the problems of erosion, transport and deposition of sediment. In late October 2012, the Carbon County reservoir held approximately 544,662 acre feet of water, according to the Bureau of Reclamation’s Great Plains Region. McElroy, an assistant professor of geology and geophysics, measures the reservoir’s bottom to estimate how much sediment infill has occurred since the reservoir became operational in 1939. To determine sediment accumulation, he uses an acoustic instrument called CHIRP, which uses sonar much like a fish finder, but more powerfully. Emitting a signal over a range of frequencies, the device can measure and image the subsurface. 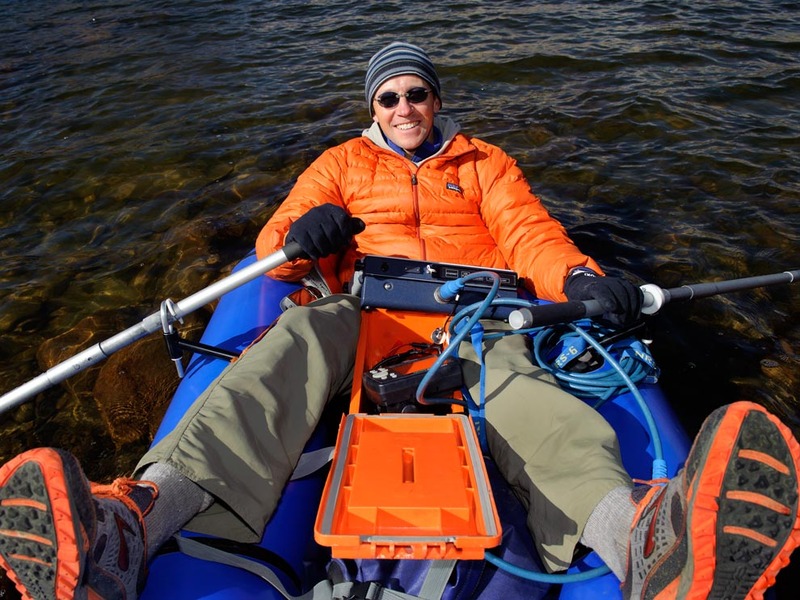 The EPSCoR grant isn’t only weapon in UW’s mission to understand the state’s hydrology. UW professors now have the supercomputing center at their disposal to conduct research on a much larger scale. Last fall, Fred Ogden and Craig Douglas teamed to map the hydrology and water use in the Colorado River Basin. Through computer simulations, the UW professors worked to determine the amount of available water in the basin—including Lake Powell, a man-made reservoir that straddles the border of Arizona and Utah—to help municipalities make more educated decisions about the long-term sustainability of water based on factors such as climate change, irrigation needs and population shifts. The lake, under the Colorado River Compact, stores 24.3 million acre feet of water for the Upper Basin states of Wyoming, Colorado, Utah and New Mexico. Under the compact’s rules, Upper Basin states must provide a minimum of 7.5 million acre feet of water annually to Lower Basin states Arizona, California and Nevada. This study is critical, Miller says, because there is uncertainty about how Wyoming will meet its own water needs over the next several decades while still being accountable to the Lower Basin states. “Climate extremes and drought, beetle kill of vegetation in uplands, and timing of the hydrological cycle is changing and inconsistent,” he says. In an effort to remove some of that inconsistency, UW professor Bart Geerts is studying cloud seeding, a process that has the potential to artificially modify the weather in order to increase the amount of precipitation in the state. He will use the supercomputer to model his data. During his cloud seeding research, silver iodide is released into the clouds through generators that have been strategically placed upwind of the ridges of the Medicine Bow and Sierra Madre mountains in southern Wyoming. The silver iodide facilitates ice crystal formation in super-cooled water clouds. “If it is shown that it works, it may continue on as something that operates in the private sector. The state or a business may want to fund it,” Kerr says. There’s another additional benefit of WyCEHG: Miller says the center will help create a robust hydrology-based workforce for Wyoming’s future. “The whole goal is to lift the enterprise here and in the state. One way to help the state is to provide competent and technical hydrologists,” he says. “Right now, engineering firms in Wyoming have not invested in near-surface geophysics. It’s very expensive and involves training. Under a formal mechanism, they’ll support internships for our students and, in return, they’ll have access to our technology and techniques.